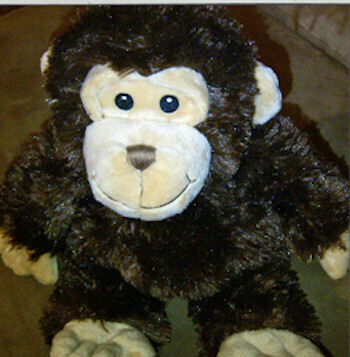 I’m searching for a 14 inch First Impressions brown plush monkey with cream ears, face, hands and feet, and stitched eyes and nose that has been discontinued from Macy’s (UPC #636206181139). “Monkey” was given to my son by his aunt. They were in Macy’s one day, and he picked it up, and wouldn’t put it down. She decided to buy it for him, and he never put it down. Eventually, Monkey joined us everywhere we went, and had the tendency to “wander off”, but we always got him back. One weekend we were visiting my brother in Louisville, and Monkey wandered off in a restaurant. We searched high and low, and we thought he was gone for good. After we had flown back to our home town, my brother was walking near the restaurant where we lost Monkey, and he found him laying in a muddy/grassy area near the parking lot. He couldn’t believe it! He cleaned up Monkey, and mailed him back to us. Needless to say, Monkey was looking a little tattered, but my son loved him even more and grew even more attached to him. Since that time, Monkey has been misplaced several times. We lost him earlier this week somewhere on the road during our vacation, and we figure he’s lost for good. My son is pretty sad about it, and I’d love to find another one. He was very attached to Monkey. My children have this monkey. They are not too attached and they could part with it for this purpose. I have an autistic son who is extremely attached to his “bear” and I understand fully how much these items mean. I learned about your service from “asyouwish” the eCrater store that helped me find a back up Bear for my son. Let me know what the process is for your services. In the mean time I will put the monkey up in a safe place. By the way, he is in good to very good condition and has had little play (mostly sat on bookcase shelf) and never has had to be washed. I ordered from eBay. Thanks for the suggestion. Hopefully it arrives soon! Thanks! Do you still have this monkey available? I am also looking for a backup! Is this monkey still available? My little girl just lost her best friend!! !